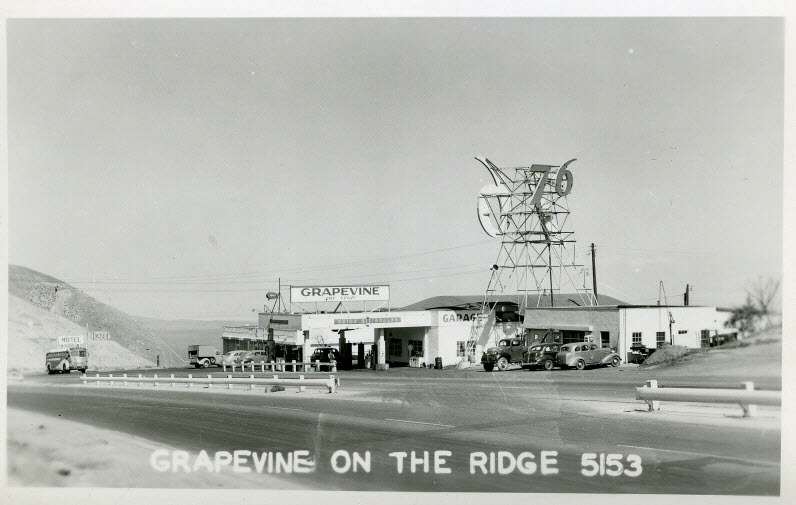 SCVHistory.com AL1946 | Ridge Route | Grapevine on the Ridge Gas Station & Cafe. Postcard of the "Grapevine On The Ridge" gas station and cafe, along the Los Angeles-to-Bakersfield Ridge Route, probably 1940s. This facility was located on the northbound lanes of Highway 99 (now Interstate 5) as the road climbed the Grapevine out of the San Joaquin Valley. AL1944: 9600 dpi jpeg from 300 dpi jpg of original postcard.